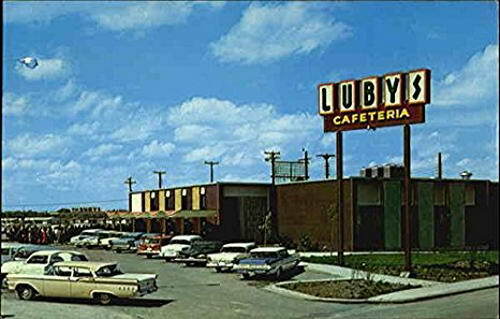 Luby's Cafeteria opened in San Antonio in 1947. If you've spent any length of time in the Lone Star state, you know what a "Lu ann" is. For those of you who have yet to enjoy this Texas treat, I'm referring to the famous combination plate that you can find only at the popular Luby's cafeterias. Like the company itself, I was born and grew up in San Antonio. Over the years, I've eaten at Luby's many times. It seemed like there was a cafeteria on every corner. Not quite, but you didn't have to go too far. My favorite Luby's was the one at North Star Mall. My mom and I often stopped there for lunch when we were out shopping. At lunchtime, the line would extend out into the mall. You could do a bit of window shopping while you waited! Once you worked your way up in line, you could look over all the offerings before you reached the serving line. Then, you would take a tray and a thick, dark-green cloth napkin roll filled with cutlery. First came salads, where Mom could order her favorite ambrosia. Next were the entrees. I've sampled quite a few, but always went back to the fried fish (which I highly recommend). Then came vegetables, bread, and the area I call Luby’s Heaven – desserts! In my humble opinion, chocolate icebox pie is the best, followed by the coconut icebox and pumpkin pies. Finally, just before a cashier handed you your check, you'd choose a drink, or maybe a deviled egg or a jalapeño or two. Then, off to search for an empty table where you'd relax and enjoy delicious food and good company. Bob Luby was only one year old when his father, Harry, started a chain of cafeterias in Springfield, Missouri. These early eateries – founded in 1911 – were called New England Dairy Lunch cafeterias and featured affordable New England boiled dinners. After receiving a degree in business administration from the University of Texas at Austin, and then serving in World War II, Bob Luby returned to Texas. Luby's, as we know (and love) it, began in 1947 when the first Luby's cafeteria opened in San Antonio. By 1959, nine locations were operating in Texas, including cafeterias in Tyler, Harlingen, El Paso, and Beaumont. The chain continued to expand, opening its first Houston location in 1965 under the name Romana Cafeteria. Luby's extended its operations outside Texas in 1966, with a cafeteria in Las Cruces, New Mexico. By 1987, Luby's had 100 locations. As of 2006, there were 128 cafeterias, with all but seven in Texas, making Luby's the largest cafeteria chain in the United States. By the way, if you're a fan of the animated TV show, King of the Hill, you'll notice that the name of Luby's combination plate is also the name of the show's character, Luanne Platter. The cafeteria itself is referred to as "Luly's." My thanks to Luby's Cafeterias for allowing me to share two of their famous recipes. This is one of Luby's most popular entrees. Place a large piece of plastic wrap over a cutting board. Lay chicken breasts down on plastic wrap, separating them by 2 inches. Cover completely with another piece of wrap. Using a meat mallet, pound each breast until 1/4-inch thick. Refrigerate until ready for breading. Place the breadcrumbs in a shallow bowl and dredge each chicken breast, pressing down firmly to coat both sides. Refrigerate until ready to cook. In a large mixing bowl, toss together the mushrooms, olive oil, and chopped garlic. Place mushroom mixture in a large skillet and sauté 3 minutes on medium high heat without stirring. Gather mushrooms into center of skillet and add wine and lemon juice. Mix well. Let simmer an additional 3 minutes. Stir occasionally. When liquids have reduced by half, remove from heat and let cool. In a bowl, toss seasoned mushrooms with parsley, artichoke hearts, salt and pepper. Refrigerate. In a large skillet over medium heat, add 2 tablespoons each of olive oil and butter. Place breaded chicken breasts two or three at a time in pan and cook 2 to 3 minutes on each side or until nicely browned and crisp. Remove and place on a serving platter. Drain excess oil from skillet. Add artichoke-mushroom mixture and capers to skillet over medium heat, tossing well to warm. Top chicken with warm artichoke-mushroom mixture, Lemon Garlic Sauce, and 1 tablespoon of fresh parsley. Serves 8. Place cream of chicken soup and minced garlic in a medium saucepan and bring to a simmer (about 2 minutes). Whisk in white wine and lemon juice. Continue to simmer for about 5 minutes. Add heavy cream and lemon zest and bring back to a simmer. Remove from stove and whisk in butter. Makes 3 cups. Preheat oven to 350°F. Cook macaroni 1 to 2 minutes longer than package directs so pasta is soft but not mushy. Drain. In a large mixing bowl, combine dry milk, flour, and butter. Whisking constantly, gradually add boiling water. Add 1 cup of cheese and continue whisking until smooth and creamy, about 2 to 3 minutes. Fold in macaroni, 1 more cup of cheese, and salt. Transfer to a lightly greased 11x7-inch casserole dish and cover with foil. Bake 25 to 30 minutes or until sauce in center of casserole is thick and creamy. Remove foil and sprinkle remaining 1 cup of shredded cheese evenly over the top. Return to oven, uncovered, until cheese melts. Serves 6. Even if the nearest Luby's cafeteria is a thousand miles (or more) away, you can enjoy many of their recipes right at home. To celebrate their 60th anniversary, Luby's has published a cookbook, Luby's Recipes and Memories.